Katy Perry and others look to the hottest affordable accessory for new lines. In what has become the latest trend of celebrity-endorsed cosmetics, you can now have a little piece of Katy Perry's "Teenage Dream" or be a "One Less Lonely Girl" to Justin Bieber right on the tips of your fingers. Celebrity names from Sarah Jessica Parker to Kim Kardashian have been a staple at perfume and makeup counters for years, but now some are lending their popular brands to nail polish lines, including singers Katy Perry and Bieber. The move has proven to be an enormous success. Buyers flushed with "Bieber fever" cleaned out the pop star's polish collection from Walmarts around the country in less than two months after his line launched in December 2010. Grand slam tennis champion Serena Williams will soon launch her "shattered" nail lacquer. Williams, who is producing her line through the nail polish giant OPI, is also studying to be a manicurist at the Palm Beach Nail School in Florida. 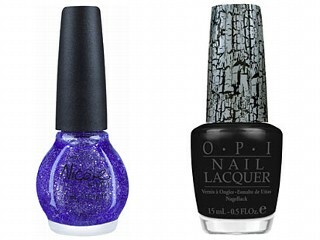 "Serena is absolutely passionate about her nails," said Suzi Weiss-Fischmann, co-founder and artistic director of OPI. "If she misses a serve, she doesn't get upset. If she breaks a nail, she gets upset." Even the cast of the hit TV show "Glee" is launching a polish line with colors named "Gleek Out," (a glittery green), "Diva in Training" (a neon pink) and of course, "Slushied" (an opaque blue). Stylish fingers and toes have become the must-have trend lately because nail polish isn't just for fun, it's also an inexpensive way to change your persona. "I always say it's the greatest accessory, most affordable," Weiss-Fischmann said. "You can change it as often as you like and you get a whole new look." In a still-struggling economy, when cosmetic sales were down across the board last year, nail polish has risen to become beauty's bestseller. According to the market research firm Kline and Company, the nail polish industry grew 14.3 percent in 2009, while sales of lipstick and gloss dropped 5.3 percent. And it's not just celebrities but also designer brands who are trying to get their hands on an industry that pulls in around $15 million a year, according to The NPD Group, a market research company. Chanel and Dior both have nail polish lines. They sell for $25 and $21 a bottle, according to their websites. The cosmetic giants Cover Girl and Revlon are also now in the nail polish business, with slightly lower-priced polishes sold at drug stores for around $8 a bottle. But the rulers of the nail polish market goes to the salon brands. Neck-and-neck with the salon brand Essie, OPI has emerged as one of the world's leading nail polish manufacturers. OPI, a family-owned business that only sold two million bottles in 1989, now sells 55 million bottles a year for around $10 a bottle. Scientists at their Hollywood, Calif. labs have produced over 1,500 shades in the past two decades, according to Weiss-Fischmann, who took our cameras on the grand tour while OPI was working on their latest line with a nautical theme. Possible color names: "Maybe 'Ships Ahoy' or 'Nautical Violet Naughty,'" Weiss-Fischmann said, noting that her company's devotion to funky names for their polishes has been vital to making them successful. "We really took nail polish just from being 'red #17' to something aspirational from the consumer," she said. "I mean, we took her to places that we could not imagine her to travel. Twice a year, we take her, give it fun names and she can identify with the colors as it becomes part of her life." In fact, the number-one-selling polish for OPI is a bright shade of red called "I'm Not Really a Waitress." "That was from our Hollywood collection," Weiss-Fischmann said. "You know, in Hollywood, everybody's an actor and actress and many of them, unfortunately, have to be waitresses in order to pay the bills...it's an incredible seller we launched 10 years ago and it's still number one." "You Don't Know Jacques," (a neutral gray), "Bubble Bath," (a light pink), "Link'n Park After Dark," (a dark purple) and "Big Apple Red" (a bright red) round out the top-five selling names for OPI. The "shattered" look featured in both Serena Williams and Katy Petty's polish lines from OPI are the next revolution found on painted fingers. As the paint dries, it appears to crack and leaves smooth, dramatic fissures of color on the nail. "This is a product that you can individualize art," said OPI manicurist Eleanor Victor.